SUVCW--Commander-in-Chief Fred H. Combs, Jr.
Fred H. Combs Jr. joined the General James A. Garfield Camp #4, Sons of Union Veterans of the Civil War (SUVCW) in Trenton, New Jersey in 1929 when he was 16 years old. He had been a member of the SUVCW New Jersey Department for 67 years when he died on December 23, 1996. His paternal great grandfather, Corporal Henry Ent, enlisted in Troop L, 6th United States Cavalry in January 1862 and was honorably discharged on January 4, 1865. His maternal great grandfather, August Levi, enrolled on January 1, 1864 in 1st Lt. Victor Valk's Company, Company D., 68th Regiment of New York Veteran Volunteers. He was discharged November 30, 1865 at Fort Pulaski, Georgia. 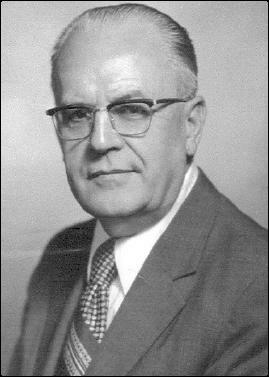 Brother Combs served in numerous SUVCW capacities in the Camp, Department and National levels, including National Secretary-Treasurer and Editor of the Banner. He was a life member and also served as National Membership-at-Large Coordinator in this membership program's infancy. In 1969, he was elected Commander-in-Chief in St. Louis, Missouri and presided at the 84th National Encampment held in Miami Beach, Florida in 1970. During World War II, he entered the Army Air Force in January 1943 and was assigned to the Second Air Force. He was discharged as a Staff Sergeant on February 21, 1946. After earning his Bachelor and Master degrees in education from Rutgers University, he was employed as a teacher, Principal and Superintendent of Schools. When he retired, he was the Assistant Commissioner of Education for the state of New Jersey. He as an adjunct professor at Rider University, where he taught a graduate course in New Jersey school law. He was a life member of seven educational organizations and past president of several. For several years, he was a member of the Delegate Assembly of the New Jersey Education Association. He also served on the Board of Governors of the National Organization of Legal Problems in Education. Brother Combs was an ordained Presbyterian Elder and served his church in many capacities. He was active in community affairs, a life member of the local volunteer fire company, a past president of the Lions Club, and a member of the American Legion. He was a trustee of the Civil War Museum in Trenton, New Jersey. In 1942, he married Marion Eggert of Lawrenceville, New Jersey and they had two daughters and two granddaughters. Marion (Eggert) Combs was elected National President of the Auxiliary to the SUVCW in 1977 and presided at the 92nd National Encampment held in Grand Rapids, Michigan in 1978.